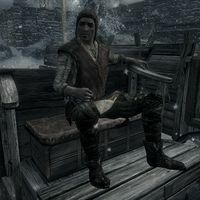 Carriage Drivers only appear during the quest Diplomatic Immunity; one of them acts as your means of transportation from Solitude to the Thalmor Embassy, where the other two drivers will be parked in the courtyard. All three drivers are Nord warriors and will disappear from the game upon completion of the quest. 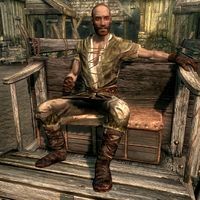 This driver appears just outside Solitude, specifically at Katla's Farm, and will transport you to the party at the Thalmor Embassy after you have spoken to Delphine. Before departure, the driver will say, "The lady's already paid the fee. We leave when she gives the word." When parked in the embassy courtyard, he will say, "I'm paid to wait to take you home. Enjoy yourself." He wears a set of farm clothes with boots and a pair of gloves and wields an iron war axe. This driver appears in the courtyard of the Thalmor Embassy when you arrive from Solitude. When approached he will either say, "Awful damn cold up here. And only the guests are allowed inside. Damn foreigners and their inhospitable ways." or just "What are you out here talking to me for? Party's inside." He wears a set of farm clothes with boots and a hat. He carries an iron war axe and nothing else. 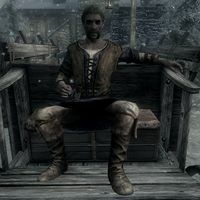 This carriage driver also appears in the courtyard of the Thalmor Embassy and is entirely anonymous, with no unique dialogue (see bugs). He wears a set of farm clothes and boots. He wields an iron war axe. According to the game files, the two drivers situated in the embassy courtyard were supposed to share the same two lines of dialogue. Due to a programming error, all dialogue options were attached to the driver near the gate, leaving the other one with nothing but generic greetings. This page was last modified on 26 November 2016, at 03:57.